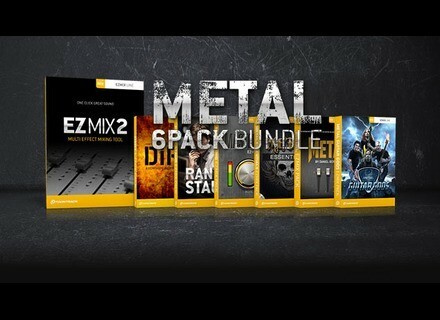 EZmix 2 Metal Bundle, Other effects bundle or multi-effect from Toontrack in the EZ Mix series. The multi-effect mixing tool EZmix 2 is bundled here with six EZmix Packs. Metal Guitar Gods EZmix Pack: Custom designed amp and cab simulation presets from four guitarists in metal: Fredrik Thordendal (Meshuggah), Mattias IA Eklundh (Freak Kitchen), Misha “Bulb” Mansoor (Periphery) and Devin Townsend (ex-Strapping Young Lad, The Devin Townsend Project). Randy Staub EZmix Pack: Randy Staub had mixed works like Metallica’s “Black Album”, Mötley Crüe’s “Dr Feelgood” and worked the sound of artists such as Nickelback, Bon Jovi and Alice in Chains. 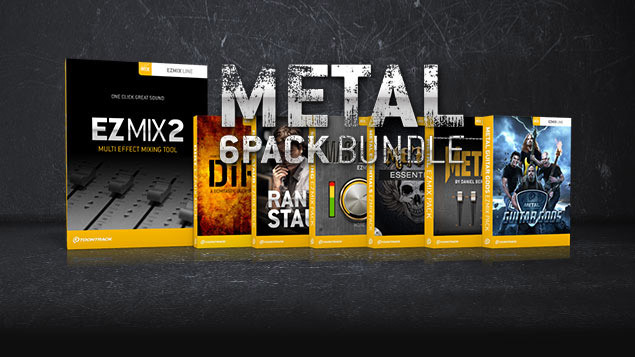 Metal Essentials EZmix Pack: This pack is designed to cover the essentials in metal mixing. Metal EZmix Pack: By engineer/producer Daniel Bergstrand ( Meshuggah, In Flames and Behemoth). Dirt EZmix Pack: Designed by Pelle Henrcisson (Refused - “The Shape of Punk to Come”, Meshuggah - “None”). Mastering EZmix Pack: This pack was designed by Mats “Limpan” Lindfors, senior engineer at Cutting Room, described as "the leading mastering studio in Scandinavia." A purchase will also give you a chance to win an electric guitar: If you buy and register Toontrack Music’s latest EZmix Expansion, Metal Guitar Gods and/or EZmix 2 before the end of November 2012 you will automatically be entered into the drawing to win an 8 string Ibanez Guitar. Arturia Spark Dubstep Arturia announces availability of Spark DubStep, a production and performance software suite dedicated to dubstep rhythm track construction. Best Service Chris Hein Horns Pro Complete Best Service introduces Chris Hein Horns Pro Complete.